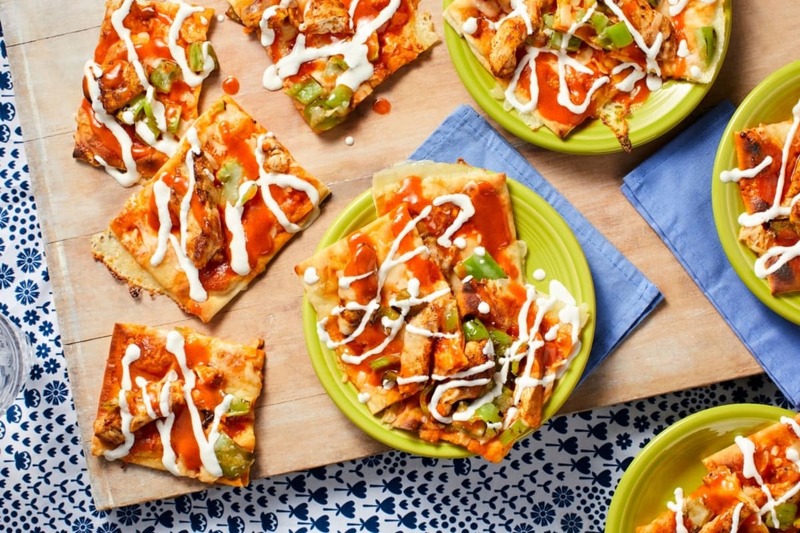 If there’s one thing we can agree on here, it’s that buffalo chicken and ranch are an almost-perfect pair. 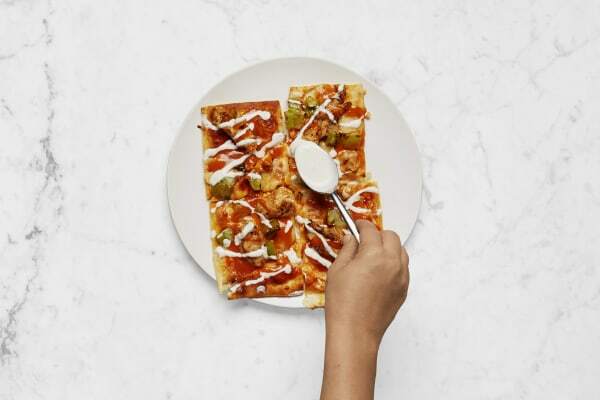 When you take that tried-and-true combo and put it on a flatbread (along with an almost-instant tomato sauce and fresh mozzarella), well, you’ve got yourself a perfectly perfect meal. Wash and dry all produce. Adjust oven rack to top position and preheat to 450 degrees with a baking sheet inside. Core, seed, and dice green peppers. Dice tomatoes. Pat chicken dry with a paper towel. 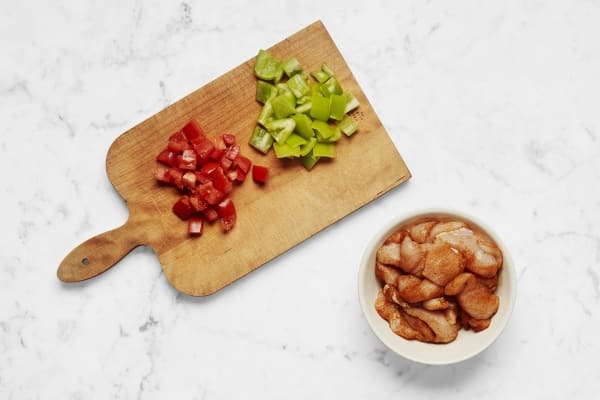 In a medium bowl, toss chicken with celery salt, 1 TBSP ranch seasoning (we’ll use more later), and a few pinches of salt and pepper. Heat a drizzle of olive oil in a large pan over medium-high heat (use a nonstick pan if you have one). 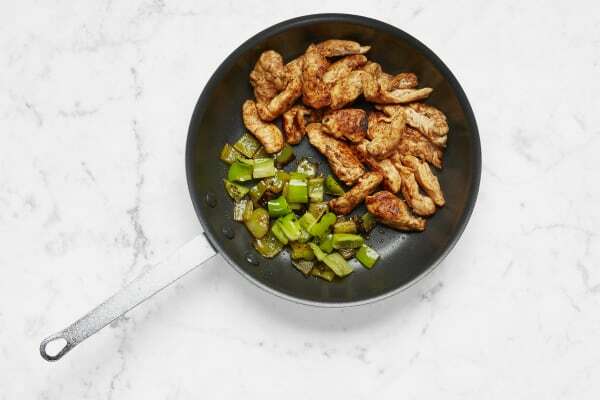 Add chicken and green peppers and cook, stirring occasionally, until chicken is cooked through and peppers are crisp-tender, about 5 minutes. Season with salt and pepper, then remove to a plate. Reduce heat under same pan to medium. Add tomatoes and 3 TBSP water. Cook until tomatoes become slightly saucy, about 2 minutes. Stir in 1 TBSP butter until melted, then season with salt and pepper. Remove baking sheet from oven; drizzle with olive oil, then place flatbreads on top. 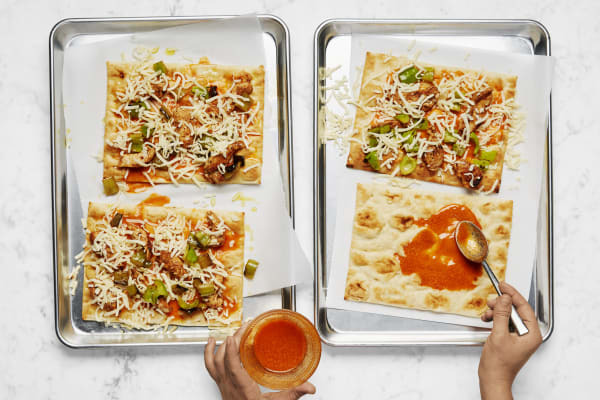 Spoon tomato sauce evenly onto flatbreads, then scatter chicken mixture on top, followed by mozzarella. Return sheet to oven and bake until flatbreads are crisped and cheese is melted, 8 to 10 minutes. Meanwhile, add 2 TBSP butter to a small microwave-safe bowl. Microwave until just melted, about 30 seconds. Stir in honey, hot sauce, and sriracha until well combined. In another small bowl, mix 2 tsp ranch seasoning with sour cream (you’ll have some seasoning left over). 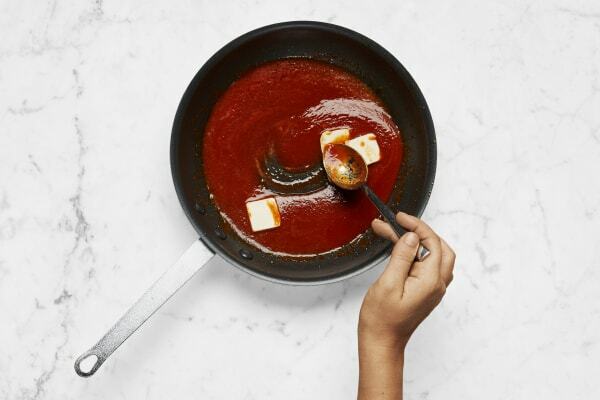 Add water 1 tsp at a time until you reach a drizzling consistency. Season with salt. Once flatbreads are finished baking, remove sheet from oven. Transfer flatbreads to a cutting board and slice. 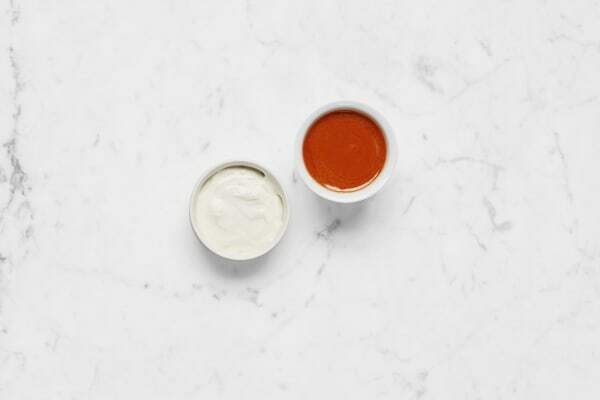 Drizzle with buffalo and ranch sauces (or serve ranch on the side for dipping) and serve.